WELCOME TO THE WORLD OF MAGIC: Harry Potter Collection of Lots! 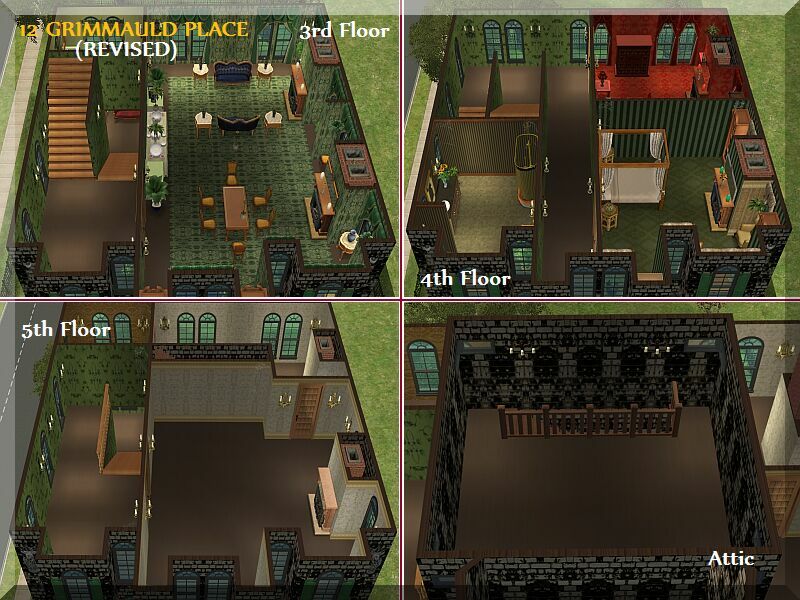 The image above gives you an idea of how to set up the Grimmauld Neighborhood. First, select a "t" intersection and place Grimmauld Square on a corner. Then place Grimmauld Place lots 11, 12 and 13 across from the phone booth side of Grimmauld Square. Place 10 Grimmauld Place diagonal to Grimmauld Square, adjacent to 11 Grimmauld Place. Place Grimmauld Place lots 7,8 and 9 in a row on the empty area of the intersection. This set includes both residential and commercial lots. There are a total of 25 download pages (with 34 individual files to download) in this collection. This is my Sim version of the Grimmauld Neighborhood. There are 8 lots altogether (7 Residential and 1 Commercial). 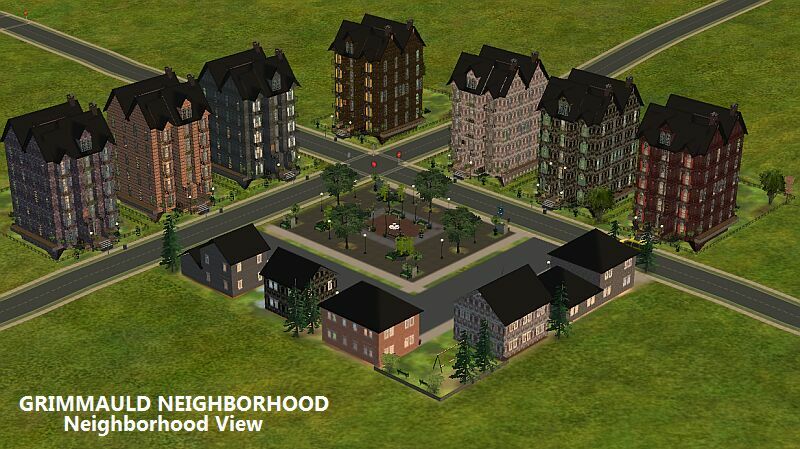 The Residential lots are exact clones of one another. They are 7 Grimmauld Place through 13 Grimmauld Place. Only 12 Grimmauld Place (THE BLACK FAMILY HOME) is decorated in the splendor of pure Black history. 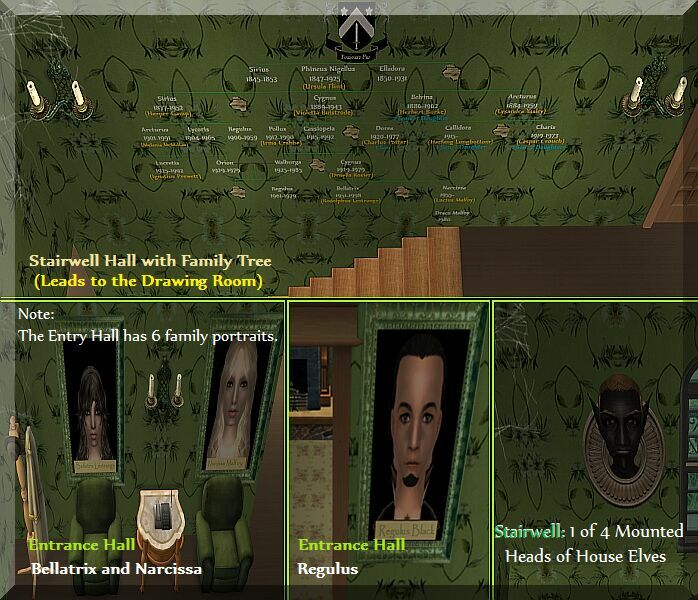 The family tree walls and the cobwebs help bring 12 Grimmauld Place to life. 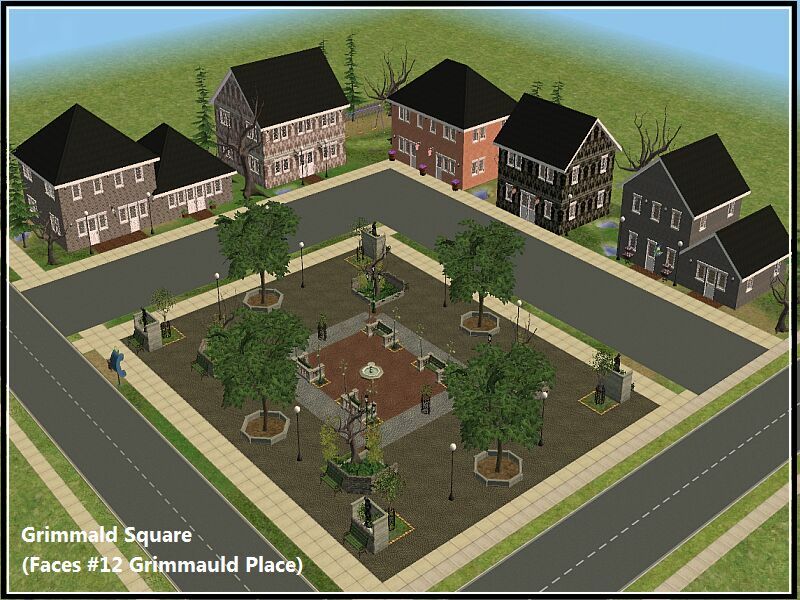 The Commercial lot includes 5 undecorated buildings surrounding Grimmauld Square and a children's park in the corner. 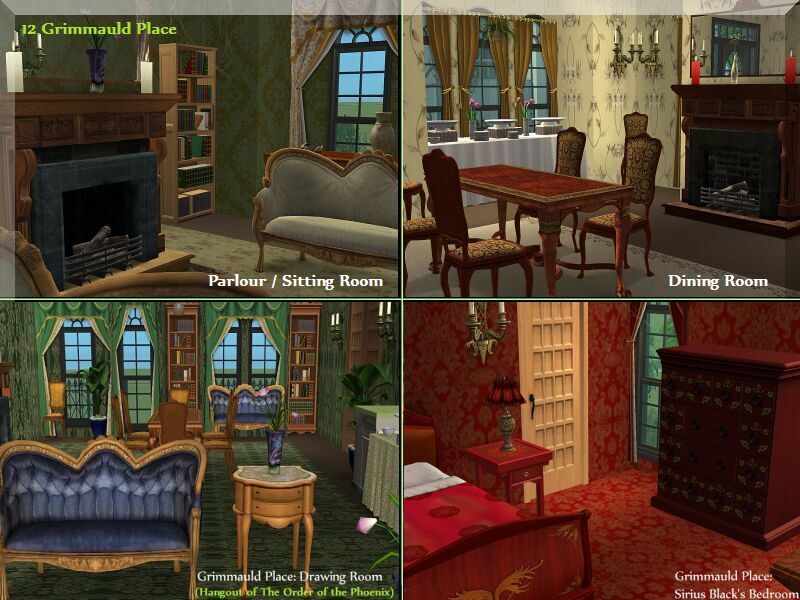 Note: I did not removed the original post of Grimmauld Place ( http://www.modthesims2.com/showthread.php?t=251664 ) because it is totally different in design and might be preferred to this newer version. 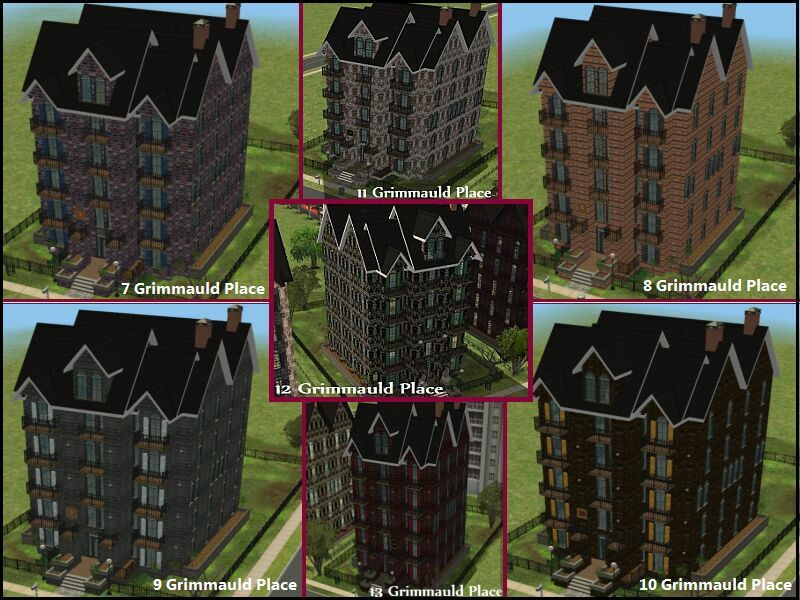 Note: All Grimmauld Place Residential lots have the have the same layout as 12 Grimmauld place. 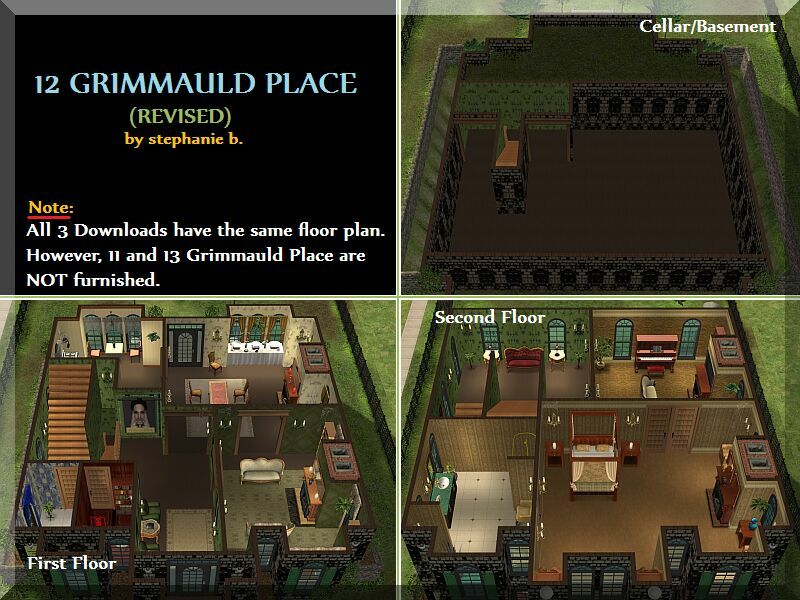 With the exception of 12 Grimmauld Place, the other lots are not decorated. I owe the deepest of gratitude to all the extraordinary artists whose objects helped to bring my vision of Harry Potter's Magical World to life! Thank you for sharing your time and talent with the Sim community. Thank you to the following artists for helping to bring a little "magic" to the Sim World: mzcynnamon, Mia86, Gromit, Khakidoo, XxHalfBloodPrincexX and Targa. Be sure to browse the links at the end of the post for other fabulous downloads by each artist! All stephanie b. walls, floors and ground covers included in houses downloaded from MTS2 can be used in lot creations on any free or pay site as long as I receive credit for the textures. Please do not post my textures (walls, floors or groundcovers) or lots on other sites without my permission or reupload them as your own by giving them color face-lifts without giving me credit for the original design. Thank you! These lots are creations from my imagination based mainly on excerpts from the books and on-line information. I am basing very little on the movie versions of each place, so don't expect exact replica's of movie versions of the various places in the Magic and Muggle World. My vision for this neighborhood is that the students do not "live" in Hogwarts. I see the school as home to only a few teachers (Dumbledore, McGonagall, Trelawney). Everyone else is spread out in either their family homes or in the Summer Houses.